Nothing looks as rich and elegant as flagstone. Whether you use it as a walkway, decking material, or indoor flooring, you want to keep your flagstone looking its best. The methods of cleaning flagstone depend on its location, and on how much cleaning is required. Be sure to find the best method for your needs to ensure that your flagstone retains its beauty. Rent a pressure washer or sandblaster from a local rental store. Often the abrasive action from the water or sandblasting will be enough to clean light to moderate dirt and staining from your flagstone walkways and decks. If not, this first step is recommended anyway to remove excess dirt before a chemical cleaner is used. Mix the acid cleaner according to the manufacturer's directions. Have a garden hose or large buckets of water ready for rinsing. Do not wait until the cleaner is applied to get water, as it acts fast and you may not have time before it needs to be removed. Apply the cleaner liberally with a long-handled deck brush to your flagstone. Wait two minutes for it to work. After two minutes rinse one of the stones you first applied the acid cleanser to and check the results. If the stone is clean, immediately rinse all the flagstone thoroughly. If it is not entirely clean, wait 30 seconds and check again. Repeat until the flagstone is clean, but do not walk away, as overexposure to an acid cleaner will permanently damage your flagstone. Muriatic acid is one of the most dangerous chemicals you can buy from a store. It also happens to work wonders on very dirty and stained flagstone. If no other method or product will properly clean your flagstone, use this product, but use extreme caution. Typically muriatic acid will come in a concentration of 31.45% acid to 68.55% other ingredients (mostly water). (See reference 2) Check to be sure your muriatic acid is this concentration and, if it is stronger, be sure to dilute the mixture to avoid damaging your flagstone. (See reference 2) Always keep a supply of baking soda on hand to neutralize any acid spills while using this product, and be sure to cover all your exposed skin as well as your eyes, mouth, and nose for your own protection. To avoid staining, seal your flagstone flooring with a durable sealant immediately after installation. 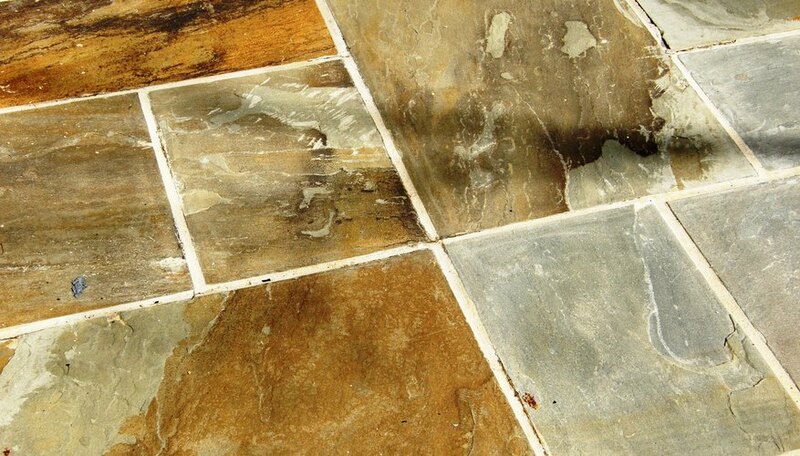 Reapply the sealant yearly or as needed, depending on the amount of foot traffic your flagstone flooring receives. What Do You Put on a Concrete Floor to Prevent Dust?